1081-1118 With the steady and imminent collapse of the reign of Nicephorus III came the big break for Alexius, the rising star of a new military genius. Nicephorus and his wife had calculated that by adopting their most likely source of trouble they would stave off the inexorable coup. Instead, it hastened it. Alexius found it trivially easy to assume the throne and take control of an empire rapidly slipping into oblivion. Alexius was more than just a good battlefield commander. He proved to have the vision and skill of a statesman as well. Measuring the dire straits the empire found itself in, he compared the two greatest risks looming over the horizon. To the west lay the decadent fiefdoms of nominally likeminded Christians who could never really bring themselves to reconcile the Byzantines as allies nor moral peers. And to the west lay the turks, persians and arabs who professed an unremitting hatred for all Christian nations. And to the north lay the endlessly troublesome and warlike tribes of barbarians. Enlisting the help of any one of them in aid against another was dangerous but to do nothing would be invariably fatal. Unable to pool its own resources thus Alexius hired one barbarian tribe, the Scythians to deal with another, the Pachenegs. With a rare favorable twist of fate the Scythians annihilated their contracted enemy and then left the Byzantines as per their deal. But the East vs. West contest would prove to be a far greater challenge. Again, if nothing were to be done Constantinople would surely fall to one or the other so action, risky or not, had to be taken. With some trepidation Alexius appealed to the Pope in Rome for help claiming the bond of a shared religion as divine obligation. Specifically, he was asking if the Holy See could furnish troops to repel the advance of the turks and return to them the occupied cities. The Pope at once accepted to help and made an impassioned speech that reverberated throughout all of Europe. Thus was born the First Crusade and many thousands began preparing for a war of epic proportions. Soon Alexius recoiled from what was about to happen. He could see at once that a Holy War against the Turks would only escalate into a larger conflict that would forever place the Byzantines as the declared enemy of the East, thus upsetting a crucial balance of power. Moreover, the crusaders, made up mostly of poorly trained militia, peasants and their families, would call on the Byzantines for support. And when this support was not forthcoming the crusaders turned on the hapless Byzantines themselves as common enemies. Alexius did what he could to control the negative effects of the unwelcome "friends" of the cause noting all the meanwhile that the conquests of the crusaders did not benefit them in any way but rather served to further weaken the Byzantines politically and financially. At home, his subjects blamed him for their continued misfortunes even though, in hindsight, it's evident that he was an exemplary administrator and strategist given his meager resources. His thirty-seven years on the throne had seen the man constantly in action and, finally exhausted, he passed away shortly after elevating his son John to succeed him. SB 1912, DO IV 20 AU Hyperpyron Obv: Christ enthroned facing, holding Gospels. Rev: Alexius standing facing, holding labarum and globus cruciger. 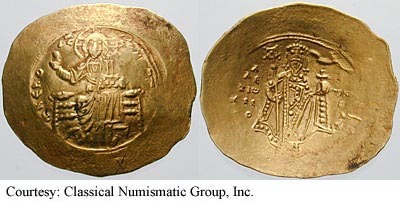 1092-1118 (Constantinople). $325 4/1/01. SB 1913, DO IV 20 AU Hyperpyron Obv: Christ enthroned facing, holding Gospels. Rev: Christ enthroned facing, holding Gospels. Alexius standing facing, holding labarum and globus cruciger. 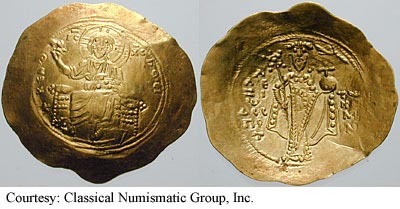 1092-1118 (Constantinople). $358 4/1/01. SB 1924, DO IV 20 AU Hyperpyron Obv: +KEROHОёEI - Christ enthroned facing. Rev: A/LE/ZI/W/Р EC/PO/T TW/KO/MNH/N - Alexius standing facing, holding labarum and globus-cruciger; manus Dei above. 1092-1118 (Thessalonica). SB 1935, DO IV 20 AU Hyperpyron Obv: Christ enthroned facing, holding Gospels. Alexius standing facing, holding labarum and globus cruciger. 1092-1118 (Philippopolis). $775 4/1/01. 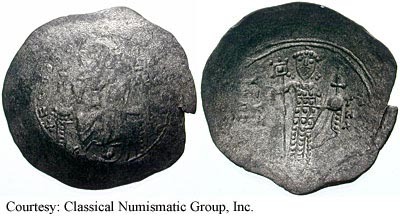 SB 1892, DO IV T1a AR Histamenon Nomisma Obv: Nimbate facing bust of Christ, holding Gospels. Rev: Christ seated facing on throne, raising hand and holding Gospels. Rev: Alexius I standing facing, holding labarum and globus cruciger. 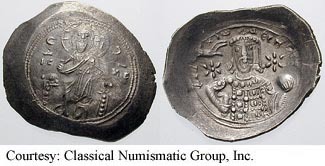 1081-1082 (Constantinople). 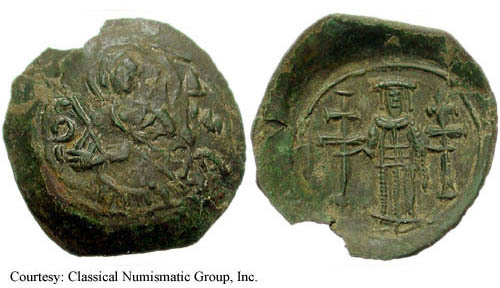 SB 1904, DO IV 4v AR Histamenon Nomisma Obv: Nimbate facing bust of Christ, holding Gospels. Rev: Nimbate bust of Christ. Rev: Nimbate and armored figure of St. Demetrius, standing right, presenting labarum to Alexius, standing facing, wearing crown and loros. 1081-1082 (Thessalonica). 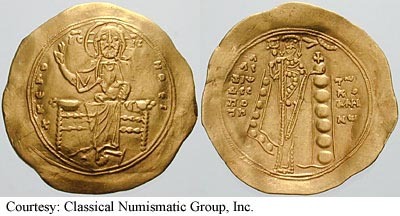 SB 1905, DO IV 5b AR Histamenon Nomisma Obv: Nimbate facing bust of Christ, holding Gospels. Rev: St. Demetrius and Alexius standing facing, holding patriarchal cross between them. 1081-1092 (Thessalonica). SB 1906, DO IV 8 AR Tetarteron Obv: Facing bust of Mary orans, medallion of infant Christ in front. Rev: Crowned facing bust, holding scepter and globus cruciger. 1081-1092 (Thessalonica). $330 9/19/01. SB 1899, DO IV 12 Thirdof Miliaresion Obv: Half length figure of the Virgin Mary, orans; head of Christ on breast. Rev: Legend in four lines. 1081-1092 (Constantinopolis). 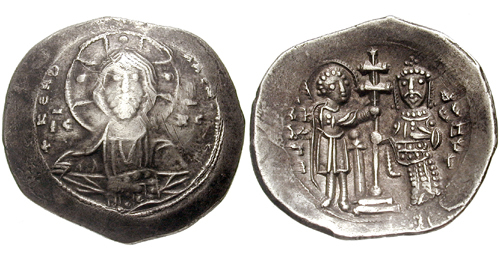 SB 1931 AE Trachy (Class VII) Obv: Half-length facing bust of St. Demetrius with spear and shield. Rev: Cross, pellets at end and within. (Thessalonica). SB 1936, DO IV 31a Billon Aspron Trachy Obv: Christ enthroned facing, holding Gospels. Rev: Alexius standing facing, holding labarum and globus-cruciger. 1092-1118 (Philippopolis?). $120 4/1/01.